First, the bad news: the saviour of faux-eyebrows, Benefit's She Laq, is being discontinued. As a long-time devotee of this product, which lacquers drawn-on eyebrows into place for over 24 hours, I'm gutted. (The decision, by the way, has been confirmed by their UK head office, although I'm afraid I don't know how widespread the discontinuation is.) This wonder bottle was the product that first reassured me of the power of cosmetics and beauty products to recreate what I'd lost facially, and I know that many other hair-free ladies feel the same way. Application: A lot less simple than She Laq, which has a little brush built-in to the bottle's lid - but, to be fair, that's because Weather Everything is primarily designed to be mixed with eyeliner itself in the little containers and then applied - not painted over (as I will be doing). The sealer comes in the form of a squeezy plastic bottle with a droplet cap, and no brushes are included. To apply, I squeezed a little into the container provided, and dipped a little brush into it, which I then painted over my faux-brows. No running or smudging of colour occurred - good stuff. Feel: good - no stiffness or irritation for me. Staying power: passed the 'rub-test' (in which I ferociously rub the sealed eyebrows) extremely well. Left to its own devices, this kept my eyebrows in place beautifully, with no discernible deterioration in appearance, even after a day. Sleep test: eyebrows sealed at 8.30am Monday morning, and slept in Monday night. Woke up Tuesday morning, and they were still there. Thumbs up. Overall judgement: as a sealer, Weather Everything is brilliant, and very well-priced. Not having a built-in brush is a drawback, but then that's not what the product was originally designed for, so it seems mean to judge it harshly on this issue. Easily as good as She Laq on the sealing and longevity front. It might run out more quickly due to the potentially wasteful application method, but it's reasonably priced, so I can't complain too much there. This is, it's fair to say, a most excellent start in the quest for the best eyebrow sealer out there. If you have another sealer or lacquer product you think stands up to scrutiny and deserves to be mentioned, let me know! I just recently bought the i.d. Weather Everything Liner sealer and haven't had the best luck with it...my drawn on eyebrows (done using Rimmel eyebrow pencils) rubbed off very easily! Almost kind of crumbled off when rubbed. Am I not applying it right? I've just been brushing over my drawn on eyebrows with the Sealer. Do you have any other product recommendations? Thanks I really love your site! A big help with makeup tricks for those of us without eyebrows or lashes! Have you ever tried Model in a Bottle? I don't know where i saw a list of the eye brow pencil, eye liner, sealer and lashes you recommend but could you please repost it again and anything else you think I might need? Thank you again, you are a God send and even more fabulous in person, if that's even possible! Thank you for this concise list, Carly! 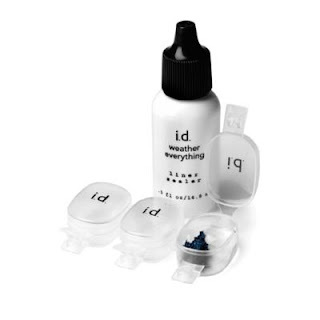 Hi Carly, I have been looking for the Weather Everything Liner Sealer by Bare Essentials and it seems to be discontinued. Is there another sealer that you would recommend? I have tried NYX and it seemed to smudge my brows that was done for me at Sephora.I too have alopeica and I am just starting to use makeup now because I never had too. I lost my brows, and eyelashes but after seeing your tutorial and even how to wear scarves I think there is a ray of hope for me. I just have to practice a lot. I just received Model in a Bottle from amazon. Total price including shipping was $13.32. Guaranteed to keep eyebrow pencil/powder makeup all day. No sticky or shining residue. I'm very impressed with this product and would recommend it to anyone who draws on their eyebrows due to hair loss. You taught me how to do my eyeliner, my eyebrows and not feel so "bald" - thank you! How are you now doing your eyeliner and your lower eyelashes? They look amazing! What products are you using? !